Gas RC airplanes (glow / nitro). The choice for engine lovers! Before we get in to this page, I should define what I mean by 'gas rc airplanes'. The term gas is often a generic one used to cover all types of IC (internal combustion) power, but this page mainly refers to the most popular kind - glow plug or 'nitro' powered planes. If you're in North America, the word gas commonly refers to gasoline (petrol), so my apologies in advance for any confusion. But with that said, IC airplane characteristics are all very similar, regardless of the exact fuel type and where you are in the world! Glow, glow plug and nitro are just different names for exactly the same power type, and before electric power became mainstream they made up the majority of planes found at your average rc airplane club field. Although perhaps not so much the majority now, glow plug powered airplanes do tend to be more restricted to club sites simply because they aren't as suitable for flying in public places such as parks, due to noise issues. Petrol (gasoline) powered rc planes aren't as common as glow powered ones, but in recent times rc engine manufacturers have been concentrating their efforts on producing more, and smaller, petrol engines and they are becoming more popular. The main advantage of petrol over glow is that of fuel cost, with petrol being so much cheaper. A petrol engine also burns cleaner, whereas glow fuel leaves a very oily residue. A disadvantage with petrol is that of smell - we all know how strong it is, and your rc airplane storage hanger (and car) can become very fumy with the slightest spillage. Both these planes, although no longer manufactured, proved themselves to be two very popular glow trainer planes, for beginners either looking to step up from an electric rc airplane or to fly IC from scratch. Sold fully RTF, no construction work is needed on these airplanes, just some basic final assembly. Of course, there are other choices available such as the Great Planes Avistar, shown below, but the NexStar Select and Alpha Trainer are worthy of a mention simply because these were two of the first mass-produced RTF gas trainers for the beginner. and proving to be equally as popular. Such rc planes like these are letting more and more people take to the skies with a proper multi-channel glow plug powered model, and this kind of plane is perfect as an introduction to IC radio control flying, either from scratch or as a natural progression from electric rc flying. Don't assume RTF means RTF! Ready To Fly glow plug trainer airplanes like the two shown above can be assembled in very little time, and that's a great incentive for anyone looking to start flying gas rc airplanes with the minimum amount of fuss. But having said that, instruction manuals do need to be read, understood and followed thoroughly and the completed airplane should always be checked over by a competent modeller prior to flight. The term RTF means that the plane has already been built and has everything it needs to fly - it doesn't necessarily mean that it's going to fly out the box without some adjustments having to be made! If you intend joining a local rc plane club and getting one-to-one instruction then your instructor will (should...) check the plane over before he flies it. If you can't or don't want to join a club and are relying on an experienced rc pilot friend to teach you, it should be his/her job to check the plane over before its maiden flight. If you can't get any club/friend help then consider joining an internet forum for help, or taking it to your local hobby shop for a check over. Whatever you do you must be happy that your airplane is 100% safe for flight before it gets airborne. The two trainer planes shown above are non-scale in that they are fictitious designs, but maybe you like the idea of flying scale rc airplanes? A scale model is one that has been modelled from a real-life plane. The choice of scale RTF glow plug powered airplanes isn't nearly as large as non-scale, but they are available. Of course, Ready To Fly isn't your only option; assembling an Almost Ready To Fly (ARF) plane or building from a kit or plan greatly extends the range of scale gas planes available. While building a model plane from a kit/plan is a very involved process, an ARF rc plane is an excellent compromise if you want a gentle introduction to model building techniques; the plane is 90% completed, you just need to buy and install the engine and radio gear and do some final assembly work. The variety of scale ARF airplanes available these days is huge, although quality between manufacturers does vary so do your research first. 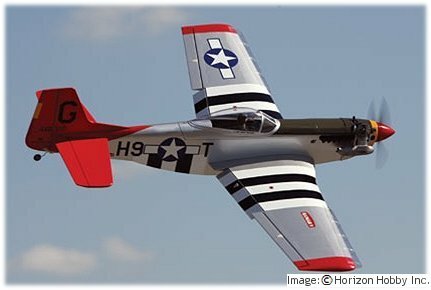 Popular scale subjects for rc pilots include P-51 Mustangs, Spitfires and other warbirds, Piper Cubs, Cessnas and vintage planes to name but a few. The actual list is seemingly endless, in fact I doubt there's a full size plane in the world that hasn't been reproduced in radio control form at one time or another! 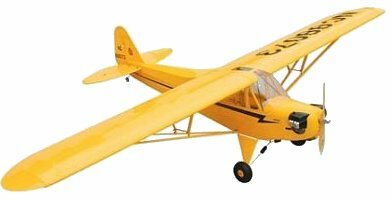 An rc Piper Cub (shown above) makes a great scale trainer and is stable and forgiving, and relatively easy to fly. The full-size Piper Cub is one of the most famous trainers of them all and is loved by pilots the world over - reasons why a radio control version is such a popular choice. Ideally fitted with a 4 stroke glow plug or petrol engine, a good quality Cub is always a pleasure to fly and offers a very relaxing experience. While a Piper Cub makes an excellent scale trainer, a warbird like a P-51 Mustang or Corsair generally doesn't and is better suited to a 2nd or 3rd model after you've gained some experience. The faster flying speeds and lower stability of rc warbirds make them more exciting in the air, but more of a handful for a beginner to the hobby. has actually been designed with beginners in mind. This particular Mustang is actually petrol powered (8cc Evolution engine) and features a few neat gizmos to make it as stable as possible in the air and easy to control at slower flying speeds. So if you don't want to take the normal option of learning to fly on a high wing trainer, this would be a very nice choice of plane. Typical rc trainer airplanes ('trainers') generally follow a basic pattern; they are of a high wing design with noticeable dihedral, which is the upward angle of each wing panel when viewed from the front of the plane. Gas trainers typically vary around the '40' or '46' size, that's to say that they are built to take a 40 or 46 (.40/.46 cu.in) 2 stroke glow plug engine (learn more about rc plane engines), and generally speaking they have a wingspan of around 60 inches/152cm. The three trainers shown at the start of this page are typical examples. This style of high wing trainer is the most stable in the air, which is exactly what you need when learning to fly radio control airplanes. So it's best to start with this shape airplane and work your way up to faster, more aerobatic (low wing) planes as you gain experience. Flying gas rc planes might restrict you to flying at a model flying club if you don't know anyone with, or have access to, any private land (access with permission, of course!). Use the rc club directory of this website to try and find your local club. Electric rc planes are much better suited to places like public parks, because they are quieter and less intrusive. Gas rc planes do require certain items of field equipment because of the engine. You can read about these essential accessories here. Gas planes are not as simple as electric ones, the engine alone means a higher level of maintenance is required, and you need to take fuel-proofing in to account. Flying gas rc planes is more 'involved' than electric, but can be more satisfying if you're mechanically minded. You'll have on-going fuel costs with a gas plane. 1. Joining a model flying club is a good thing to do and an excellent way to become quickly involved in the hobby; you'll make new friends, learn heaps of stuff and be able to share your enthusiasm with lots of folks who will actually understand your new found passion! 2. Although some accessories are essential, many of them can be lent to you by fellow modellers that you fly with, this is especially true if you do join a club. So in your early days you can get away without buying everything in one hit. Or you can save some money and buy the essential items in a 'field pack' instead of individually. 3. Higher levels of maintenance and involvement is never a bad thing; you get to learn a lot more about your plane and how it works, and as a result you'll get more out of your new hobby. 4. There's no real defence to the on-going fuel costs; over a year you will spend more on fuel than you will on buying a few battery packs for an electric plane. Sorry! All I can say here is that a petrol plane will cost you less than a glow plug one to fill up. Gas rc airplanes will bring you lots of fun and excitement but do be aware that they are a few steps up from simple electric powered rc airplanes, both in terms of learning and cost. Having said that, prices are falling and a fully RTF trainer for just a few hundred dollars is a very good sign of things to come. So if you're an engine lover and need the noise and smell of internal combustion power to keep you happy, why not try and contact your local club, pop along to their flying field and chat to some pilots to see how it's done.